This version of the card game Hearts is for large groups. Cancellation Hearts is for 6 to 11 players. Two standard 52-card decks are shuffled together. A (high) to 2 (low). At the end of the game, the player with the lowest score wins. Win all 13 hearts and the Black Maria. Deal the cards as evenly as possible to all the players. Any extra cards are placed face down on the table. The winner of the first trick takes those cards (making it extra dangerous to win the first hand). After looking at his or her hand, each player chooses three cards and passes them face down to another player. All players must pass their own cards before looking at the cards received from an opponent. The passing rotation is: (1st hand) to the player on your left, (2nd hand) to the player on your right, then repeat. 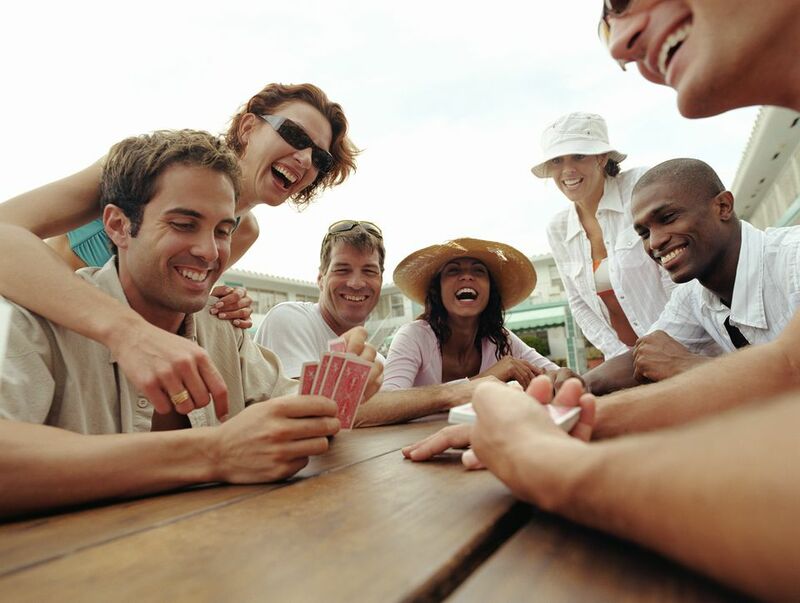 The player to the dealer's left leads the first hand. He can lead any card other than a heart or the Black Maria. Each player must follow suit if possible. If a player has no cards in the suit led, a card of any other suit may be played. Hearts may not be led until a heart or the Black Maria has been played (this is called "breaking" hearts). The Black Maria can be led at any time. If two players play the same card (which is possible since two decks are shuffled together before cards are dealt), those cards cancel each other out and neither can win the trick. Use a score sheet with a column for each player. At the end of each hand, count the number of hearts each player has taken, as well as the Black Maria. Hearts are 1 point each; the Black Maria is 13 points. If one player has won all 26 hearts and both Black Marias (a truly remarkable accomplishment), that player can choose to subtract 26 points from his or her score or to add 26 points to every other player's score. Cancellation Hearts is often played to 150 points (any score can be agreed on before the game begins, but 100 is a good minimum). When one player reaches or passes the agreed-upon score, the game ends. The player with the lowest score wins.